1.We manufacture and supply EMP and custom machine control panels fabricated from fine grade raw metal components procured from reputed vendors locally. 2.Our Machine Control Panels are designed to work on the Electrical Switchgear Logic. 3.Our specific range of machine control panels and EMP panels are widely used in a range of industrial and machine control applications. 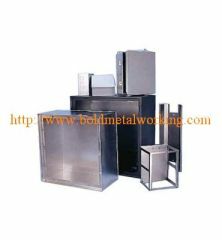 4.We fabricated our entire sheet metal product range as per the specified requirements of our clients. *we can design custom machine control panel box as per your drawings or samples.